Periodontal disease is the biggest contributor to dental problems in pets. Most dogs and cats have some stage of periodontal disease by the time they are 2 or 3 years old. Dogs and cats use their mouths and teeth to maneuver through the world in ways we never will. However, they face some of the same dental disease risks as people. HealthyPet asked Dr. Kate Knutson, a veterinarian at Pet Crossing Animal Hospital & Dental Clinic in Bloomington, Minnesota, to answer some common dental questions. Dr. Knutson served on the task force that developed the dental guidelines for the American Animal Hospital Association. Q: How many teeth do dogs and cats have? A: Most adult dogs have 42 teeth, and most adult cats have 30 teeth. For comparison, people typically have 32 permanent teeth. When do baby teeth fall out, and what happens to them? This is breed and genetically dependent, so baby teeth will fall out at different times. But in general, around 14 to 16 weeks of age, pets begin losing their incisors (front teeth), with others following in later months. 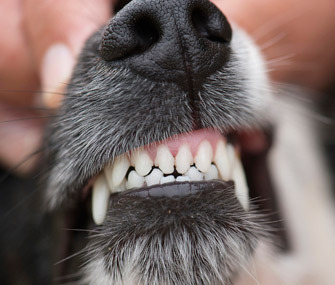 The canine teeth (“fangs”) usually fall out when the dog or cat is between 4 and 6 months old. A lot of times, people never see the baby teeth after they’ve fallen out because the teeth are swallowed or fall out when pets are outside. Do pets ever have extra teeth? Yes. Pets can have retained baby teeth (also called deciduous or primary teeth), with adult teeth and baby teeth occupying the same position, or supernumerary teeth, which are extra adult teeth. Retained baby teeth are bad, bad, bad. They cause the upper and lower teeth to line up poorly (malocclusion), which can result in gum injury and disease. Retained baby teeth can also alter jaw alignment, causing pain and difficulty chewing. If your pet still has baby teeth at 5 months of age, notify your veterinarian. Baby teeth can force adult teeth out of line, so any retained baby teeth need to be extracted as soon as possible. Some breeds, such as terriers, are especially prone to having extra adult teeth. These extra teeth, which can grow next to normal teeth or even through the roof of the mouth, should also be removed by your veterinarian. What is the biggest factor that contributes to dental problems in pets? The biggest issue is probably periodontal disease, which is inflammation of the teeth’s support structures. Depending on how advanced the disease is, only the gums may be affected or all the support structures may be involved. In some cases, there may be inflammation, swelling, bleeding, infection and bone loss, which will require extensive work to make the mouth healthy again. Periodontal disease begins when dental plaque (which contains bacteria) builds up on our pets’ teeth. Plaque reforms quickly, so if it isn’t removed frequently (through daily brushing and regular cleanings), it will turn into tartar. Unless it is removed by your veterinarian during a cleaning, tartar will eventually destroy the tooth and surrounding structures. Most dogs and cats have some stage of periodontal disease by the time they are 2 or 3 years old. Think about it: If we didn’t brush for years on end, our teeth would be falling out from disease. So it is very important to learn about brushing your pet’s teeth and taking her to your veterinarian for regular oral care evaluations and professional cleanings.